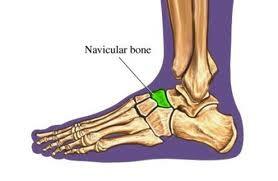 Location of the Navicular Bone. Kohler’s Disease is an uncommon condition that affects the inner aspect of the mid-foot. It is part of a group of conditions called avascular necrosis disorders. This is Latin for ‘bone death due to lack of blood supply’. It occurs between 5 and 9 years of age, mostly in boys. Kohler’s disease refers to bone death in the Navicular bone. After the blood supply is lost, the bone tissue dies and collapses inward on itself due to the normal compressive forces that come with walking. It generally doesn’t cause serious long term effects, although the Navicular bone will usually keep a flattened appearance through life. Those suffering Kohler’s disease will experience quite severe pain and swelling in the inner border of the middle part of the foot. The pain will always be sufficient to create a limp and a need to bear weight on the outside edge of the sole. and usually limp as a result. Patients that walk with a limp tend to walk with increased weight on the lateral side of the foot. The cause of Kohler’s disease is not well understood but probably requires an unusually high compression force on the bone. It may be more common in a Metatarsus Adductus foot type where the foot curves inwards more than usual. Treatment involves rest meaning being non weight bearing for two months, perhaps in a cast. Much will depend on the age and ability to cooperate of the child. Often, the podiatrist will prescribe an arch support of the child to normalise the foot position and pressures of weight bearing. Generally, the span of the disorder from commencement to complete resolution will take around two years.